Rating of construction reliability is an important benchmark for potential investors, real estate buyers, which can provide them with guidance when choosing a construction object. Rating of construction reliability allows Customers to stand out from other market players, to demonstrate benefits of a construction project as compared with other objects in the market, as well as to provide such information to potential investors in a suitable format. Rating of construction reliability is determined in accordance with the Procedure of rating and Techniques developed by IBI-Rating. Analytical group, guided by the above-listed documents, carries out a full-scale research of qualitative and quantitative indicators of the construction reliability, and on the basis of the research findings a rating report is produced and the key factors affecting the grade of rating construction reliability are determined. A rating report is the main document, which is submitted to the members of the Rating Committee (a collegial body) for decision-making on determining the rating of construction reliability. Further, the Rating report as well as the Rating Committee’s Decision are presented to the Customer. In addition, the Customer is provided with a Certificate of the grade of rating of construction reliability and an Information logotype that the Customer can use for marketing purposes, i.e. to be placed on the Customer's website, information portals, as well as in the presentation materials. Aiming at ensuring the relevance of the rating of construction reliability, IBI-Rating begins a procedure of monitoring of the Customer’s activities on the day following the rating assignment, periodically updating the results of the previously assigned rating. Scheduled review of the rating takes place on a quarterly basis. Such a monitoring procedure enables users of the Rating of construction reliability to stay informed about the state of affairs of the Customer of rating. 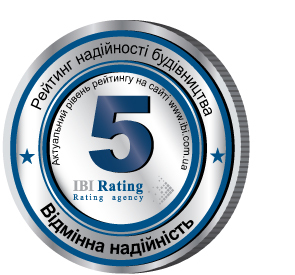 Throughout the whole period of monitoring of the Rating of construction reliability, IBI-Rating provides information servicing of the rating, which contributes to the creation and support of the Customer’s business reputation and allows to communicate with potential investors.